When you think of great American cities, what comes to mind? New York. Los Angeles. Chicago. Washington, DC. While it may not be the first city you think of, Philadelphia, Pennsylvania is one of America’s most historically important cities. The first capital of America, Philadelphia was where America declared independence from Britain. Not only that, but it’s home to the US Constitution, Benjamin Franklin, and delicious cheesesteaks. This past weekend I visited Philly for the first time since I was a kid. I don’t really know why it’s taken me so long to get back. After all, I’ve lived within three hours of the city for most of my life and have always been interested in history. It just isn’t somewhere I ever got around to visiting. However, I’m really glad I finally got a chance to visit the city again. Philadelphia is a vibrant destination with a lot to offer those interested in history, culture, or just strolling through a fantastic city. It’s also super easy to get to. Sitting on the main highway and rail line between New York City and Washington, DC, there’s really no reason not to visit Philly when you’re on the east coast. Fortunately for visitors, a visit to the City of Brotherly Love doesn’t have to drain the back account because many of the city’s best attractions are free! Here are seven of the best free things to do the next time you visit America’s first capital. 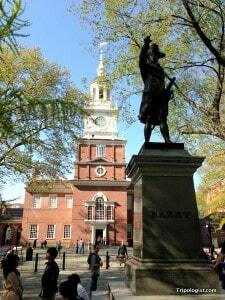 Independence Hall is one of the most important buildings in American history. 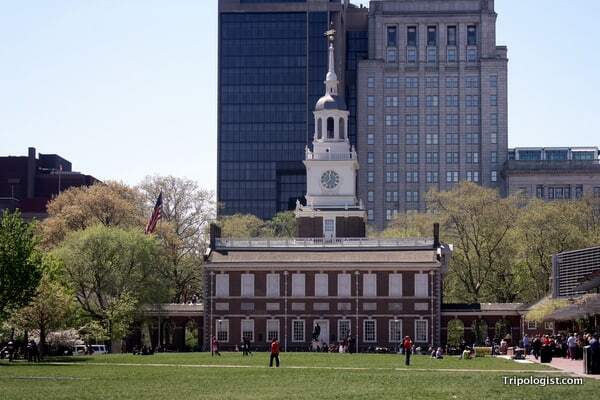 Out of all of America’s buildings, Independence Hall might be the most important one. It was in this building, once known as the Pennsylvania State House, that the Declaration of Independence from Britain and the US Constitution were signed. Famous Americans such as George Washington, Thomas Jefferson, Benjamin Franklin, and John Adams spent many long hours debating the merits of these important documents inside the building. Today, free tours are available of Independence Hall, though prior reservations are recommended during the summer months and on weekends. One of the world’s most famous bells, the Liberty Bell is an American icon. Having once hung from the bell tower of the nearby Independence Hall, the bell already had a prominent place in American history. However, what’s made the bell so famous is its large crack that, somewhat ironically, made it unable to ring. Sitting in a building next to Independence Hall, its former home, the Liberty Bell is now an attraction itself. While the queue might be long, seeing the Liberty Bell in person is a must for any visitor to Philly. Once home to the city’s many garment shops, South Street has become the go to destination for trendy shops and great food in the city. A walk down the street gives you a great chance to see Philly’s culture, sample some excellent food (I highly recommend Jim’s Steaks for a great cheesesteak! ), and do some shopping. 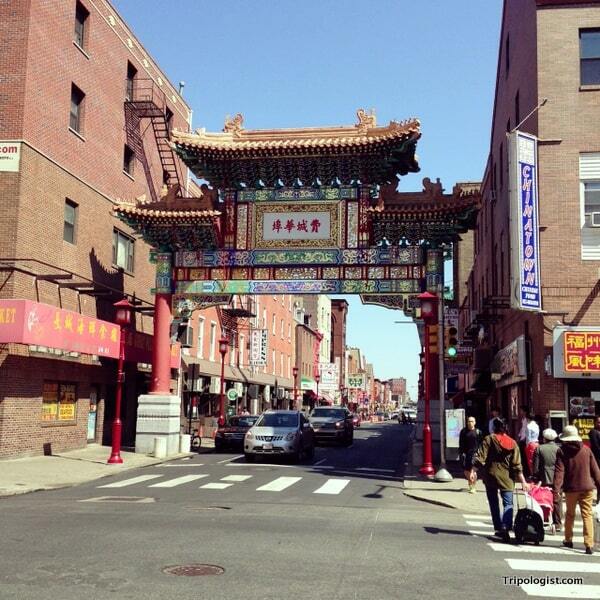 Honestly, I was a bit surprised that Philadelphia was home to a fairly large and vibrant Chinatown. Sitting only a few blocks away from Independence Hall, Philly’s Chinatown is home to a wide variety of restaurants and shops from all throughout Asia. With highly rated restaurants from China, Korea, Japan, Malaysia, Vietnam, and several other countries, Chinatown is a great place to grab a bite to eat or just stroll through a section of town where you’re more likely to hear Chinese than English. If you’re a fan of the sometimes awesome, but always mystifying, world of modern art, then the Institute of Contemporary Art is a great place for some cultural awakening. The location of Andy Warhol’s first museum show, the Institute has always been on the forefront of modern American art. The exhibitions at the museum change three times a year, making it a great destination for every visit to the City of Brotherly Love. As the home of one of the world’s first volunteer fire departments, Philadelphia has a rich fire fighting history. It’s no real surprise then that the city hosts a large museum dedicated to fire fighting. Housed in a restored fire station, the museum features a variety of fire fighting equipment and paraphernalia from the last 225+ years. Don’t miss the excellent collection of antique firetrucks. Other than Benjamin Franklin, Rocky Balboa might be Philadephia’s most famous citizen. Set in Philly, the six ‘Rocky’ movies tell the story of a boxer who overcomes advercity to become one of the world’s greatest boxers. In one of the most famous scenes from the first movie, Rocky runs up the stairs to the Philadelphia Museum of Art. Today, the scene is repeated on a daily basis by tourists from throughout the world. While the museum costs money to enter, running up the steps to glory is free. Looking for other things to do in Philadelphia? I’ve compiled the biggest list of free things to do in Philadelphia on my other site, UncoveringPA.com. Find somewhere great to stay in Philadelphia, Pennsylvania! Do you have any other suggestions for free things to do in Philadelphia? Let us know in the comments section below. Since you’re a fan (in addition to other readers) of Korean food as well, when I’m in Philly I sometimes head to Upper Darby (take SEPTA to the 69th Street Transportation Center) to the H Mart. While the supermarket is a US chain, t’s also not (likely) to be free, as there’s a small food court on the 2nd floor. The Wissahickon Valley Trail is also a pleasant spot, though that too probably requires a bus ride. Thanks for the suggestion. I found a pretty good Korean restaurant in Philly’s Chinatown, Sammy Chon’s. While their kimchi wasn’t really that good (heresy for a Korean restaurant), their bibimbap and bulgogi weren’t bad. I only went there for a day. Didn’t pay a cent on anything but food and had a great time. A very underrated destination for tourists, American and foreign.